The FBI is helping Qatar investigate the source of an alleged "hack" of state media which sparked diplomatic tensions in the Gulf, a source with knowledge of the probe said Friday. An FBI team has been in Doha for the past week after the Qatari government asked for US help following the claim of an unprecedented security breach by hackers last month, the source told AFP. "American support was requested and a team sent which has been in Doha since last Friday, working with Qatar's interior ministry," the source said. Two other unnamed countries are also helping with the probe. The results of the investigation could be released as early as next week. Qatar has said it would publicly announce the results of the investigation. Doha launched the probe after accusing hackers of publishing false and explosive remarks attributed to Emir Sheikh Tamim bin Hamad Al-Thani on the Qatar News Agency website last month. The alleged comments were made after Trump's visit to the region at the end of last month. However, Doha has denied all the comments and said it had been the victim of a "shameful cybercrime". At the same time, the tiny Gulf state said it had also been the victim of a hostile media campaign, particularly in the US over the issue of its supposed support for Islamist groups. Qatar has so far given no indication of where the alleged cyber attack, which happened on May 24, originated. 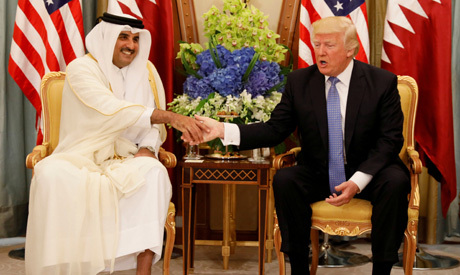 But regional powers including Saudi Arabia and the United Arab Emirates have used the comments to demonstrate that Qatar is out of line with Gulf foreign policy, especially regarding Iran. Media organisations in several countries in the region reported the emir's comments as fact, despite an official denial by Qatar. Qatari broadcasters and websites were blocked in several countries after the alleged comments were reported. And in a sign that the rift in Qatar's relations with its near neighbours was deepening, one Saudi newspaper reported that members of a prominent Saudi family had demanded that Qatar's state mosque, the Sheikh Muhammad Ibn Abdul Wahhab Mosque, be renamed. The demand came amid questions over the Qatari royal family's link to Abdul Wahhab, co-founder of the Saudi state. Some experts fear the current situation could trigger a repeat of the crisis in 2014, when several Gulf countries recalled their ambassadors from Doha, ostensibly over its support for the Muslim Brotherhood. Earlier this week, the Qatari emir travelled to Kuwait to meet Emir Sheikh Sabah al-Ahmad Al-Sabah in what was widely seen as an attempt at mediation by the Kuwaitis.